Home / Breakthrough Breat Cancer / A week of fundraising…and a few books sell! The last 7 days have been busy but rewarding; we have been raising funds for 3 charities via a number of events plus I have been selling the book to all and sundry. I have already blogged the Breakthrough Breast Cancer bake sale that was held last weekend; this raised an amazing £669 for our Team Nightrider challenge ride in June. It was great to meet and chat with people who had turned out to support us, in addition, our team captain and his partner turned up from Manchester way to lend a hand. His passion and enthusiasm for fundraising is second to none. I played cricket on Sunday, enjoying a freezing cold 40 overs on the hill at Challow. I desperately want to retire from cricket, it hurts to play now. The great irony is that I am fitter now than I have ever been but my joints will not allow me to play like my 25 year old self. It was good to play against Letcombe and chat to players like me who have been around for ever. 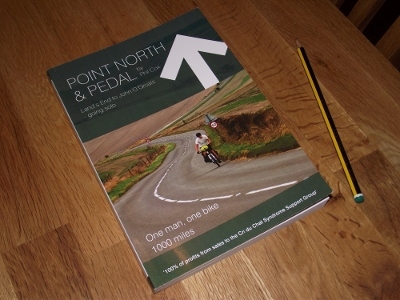 Monday saw the arrival of the first 100 books, now the work of fulfilling orders begins. Most of the set-up around posting books out had already been done so it was a case of logging the sale and dispatching them. The next step was to contact those who had expressed an interest and work out how to get their copy to them without posting. Ray took 5 copies to stock at Ledbury’s in Wantage and has sold at least 3, the Village shop in East Hanney also have 5 copies which I hope to sell on the back of a letter to the Hanney News. Sales have been brisk; the first 100 have almost gone and I need to order a second box. Breakeven is 50 books but I know that I have a dwindling market now. I have saved a lot of the marketing for the second box plus I have a piece coming out in the local press later in May. Facebook is an awesome network when it comes to letting people know what you are doing. I have been contacted by people because of the sharing that goes on, it’s very uplifting when a new e mail comes through confirming a purchase from someone you don’t know. The third lot of fundraising was completely by chance and I will blog this separately. Once again, our amazing community clubs together to get things to happen.